A few weeks ago I found myself back in a place that I had said goodbye to for what I had thought was forever… or at least a while. 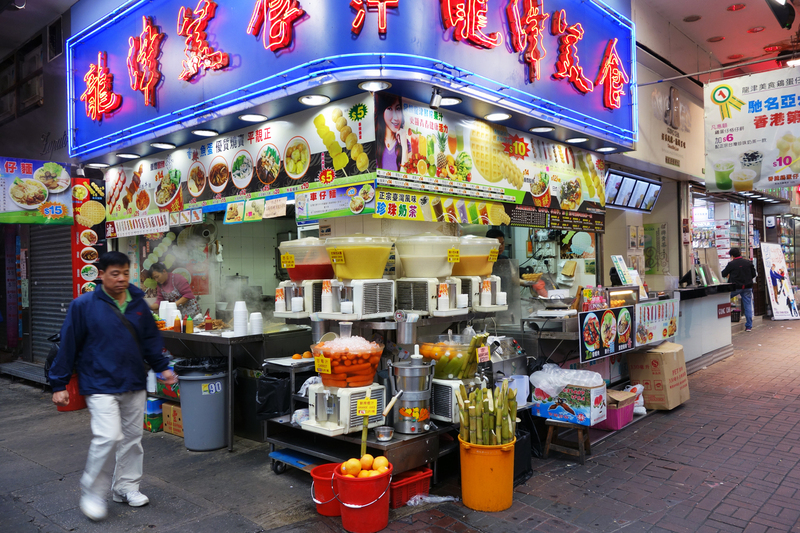 But life works in strange ways, and by a turn of fate I was given another chance to do something I had always regretted not having done, a proper photo-shoot of my three favorite street food stands in Mongkok. 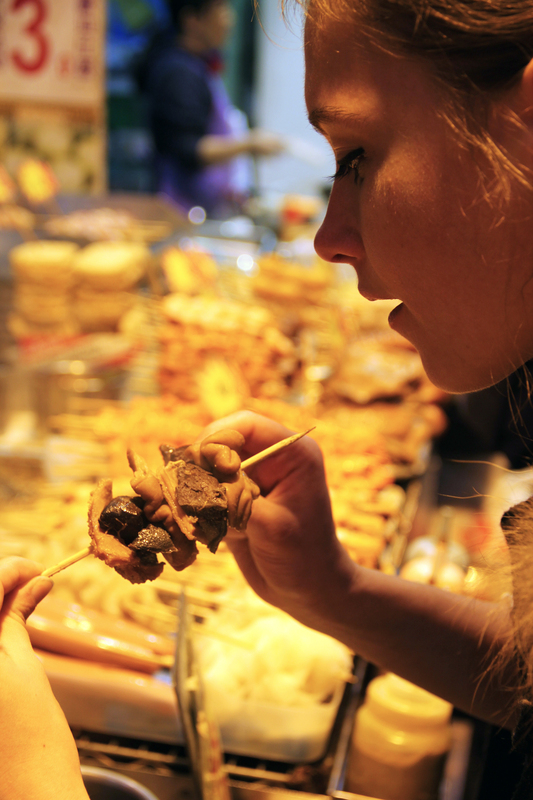 Living in Hong Kong, I often wandered the markets of Mongkok with my fellow skull-bag-fiend, Austrian companion on countless Sunday mornings, a bit woozy from the night before, self medicating with haggle-priced retail, fresh fruit juices and greasy meat parts on a stick. Especially after spending the greater part of these afternoons in the Kowloon Park Swimming Pool, soaking up rays of sunshine while creepy be-goggled Chinese schoolboys peeped our bikini bottoms underwater, walking the crowded streets of Mongkok and subjecting ourself to the noises, the movements and the crazy flavors of the market always slapped us back into shape, leaving us glad that we had not suffered the day out at home watching TV. 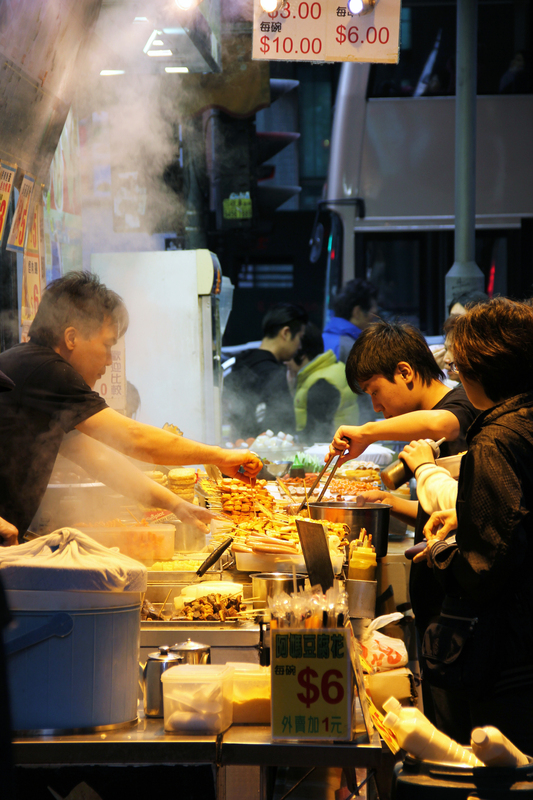 Throughout these adventures, I visited three street food spots especially frequently, all three of them located at one of the intersections of two of the major market streets in the neighborhood. 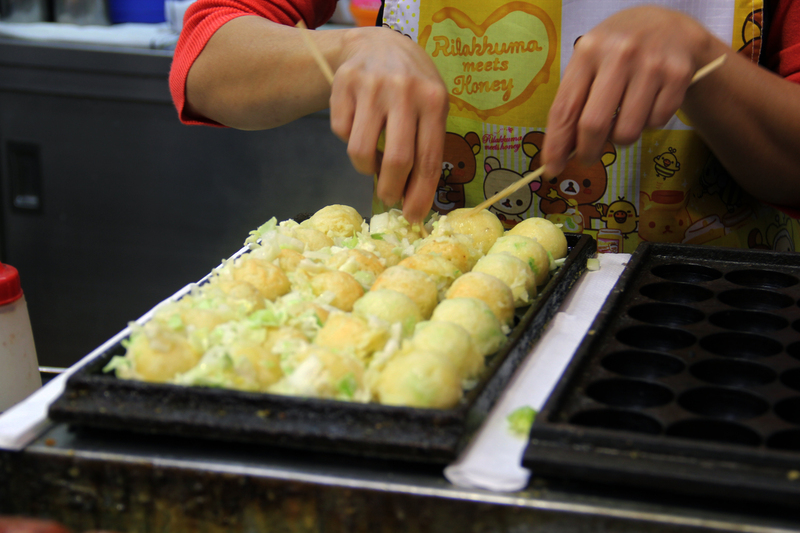 This stand quickly became one of my favorites, mainly because it was one of the only places I could find fried stinky tofu and these delicious folded and grilled scallion dim sum on a stick. I’m pretty sure the latter is an invention of the woman who makes them, as I have not seen them anywhere else in the city. 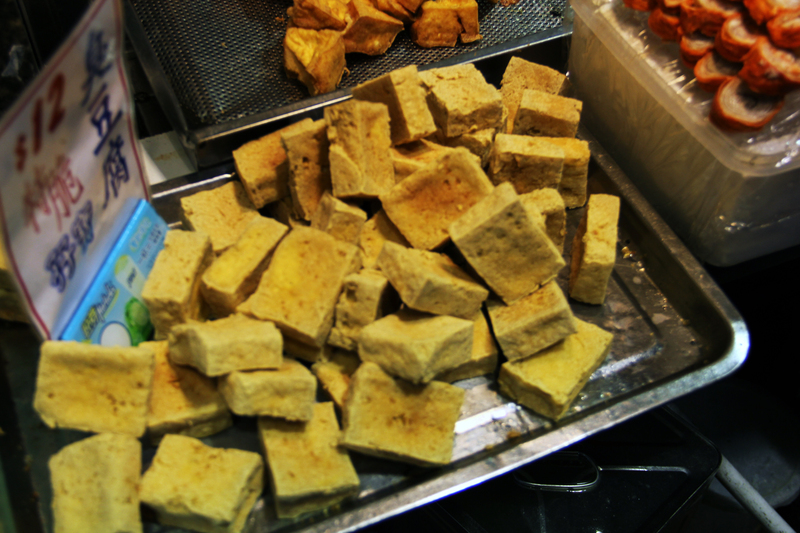 The place has a deep-frier in the back, where the minced fish stuffed eggplants and peppers, along with the tofu is prepared. 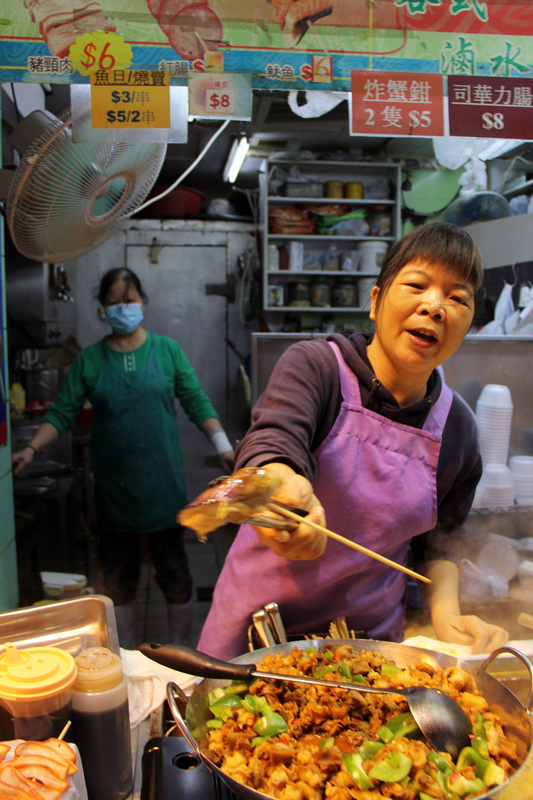 There is also a small grill out front, where a bandana-mouthed woman patiently flips her turnip cakes, sweet glazed chicken wings as well as beef, pork, octopus and fish balls on a stick while crowds of customers impatiently shout their orders and wave their bank-issued bills in the air to show they’re good for it. 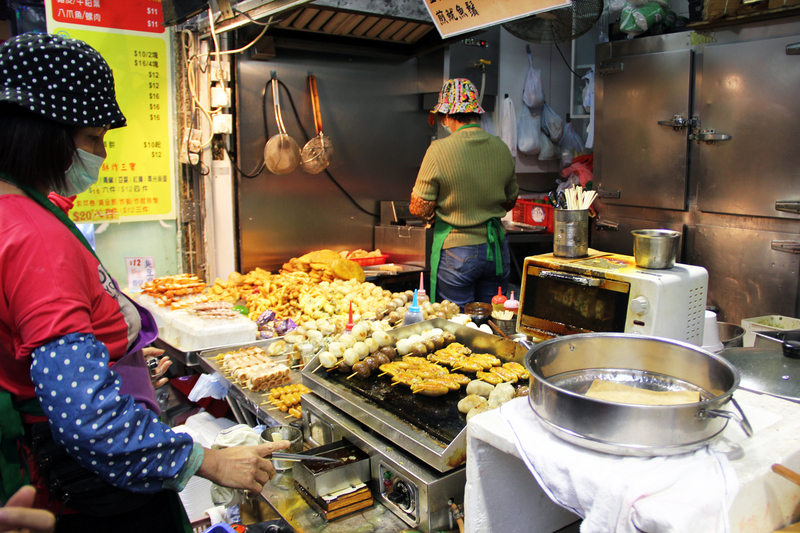 In all the time I spent in Hong Kong I never learned what the etiquette for ordering at one of these stalls actually is. There is no “Order here” or “Pick up here” spot marked. The ladies just kind of remember the orders (or not…) and hand little bags of stuff out to people in a seemingly completely random fashion. I’ve been loudly chastised in Cantonese both for skipping ahead of the line and taking a stick of beef balls that apparently belonged to someone else. Yet, I’ve also been chastised for not speaking up (or pointing, rather…) properly and loitering aimlessly in a spot that was apparently meant for ordering, not browsing. After a while I completely lost hope in learning the rules and I just kind of acted ignorant in order to get what I wanted, shrugging my shoulders as I walked away with my tasty prize… I suggest you do the same. The slightly less chaotic Fa Yuen leads one gradually into the craziness of Ladies’ Market. 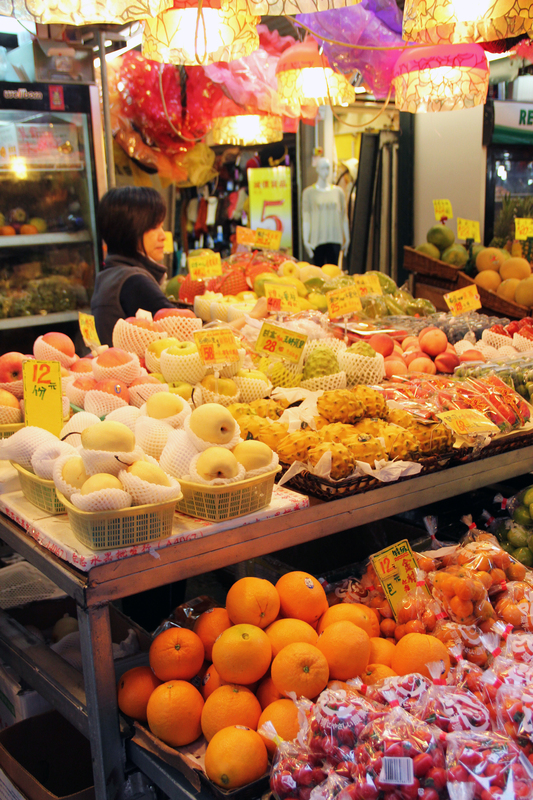 It is a street lined with stalls of fruit towered high, bright little things that were once exotic to me, notably rambutan, as well as yangmei, salak and pitaya. 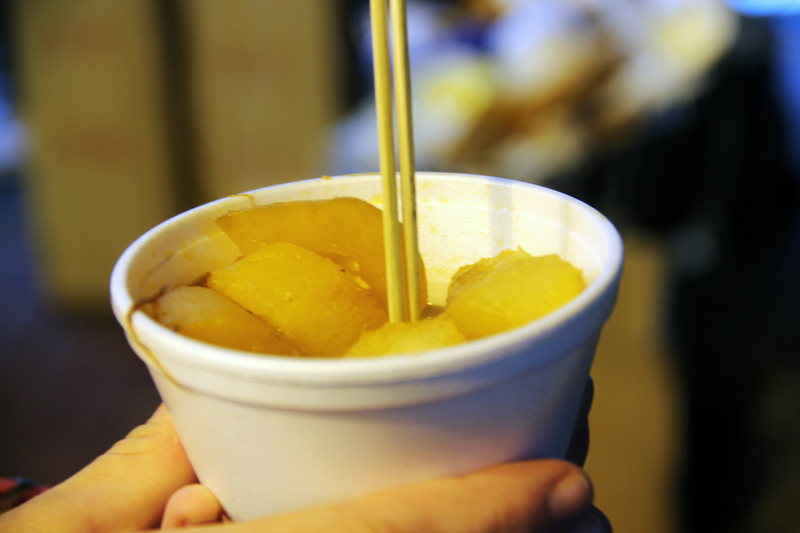 Chinese pears, which I used to eat at least one of every day, can be found here as well. Fa Yuen is where my memorably painful durian misadventure took place. It is also where the fruit juice magic occurs. 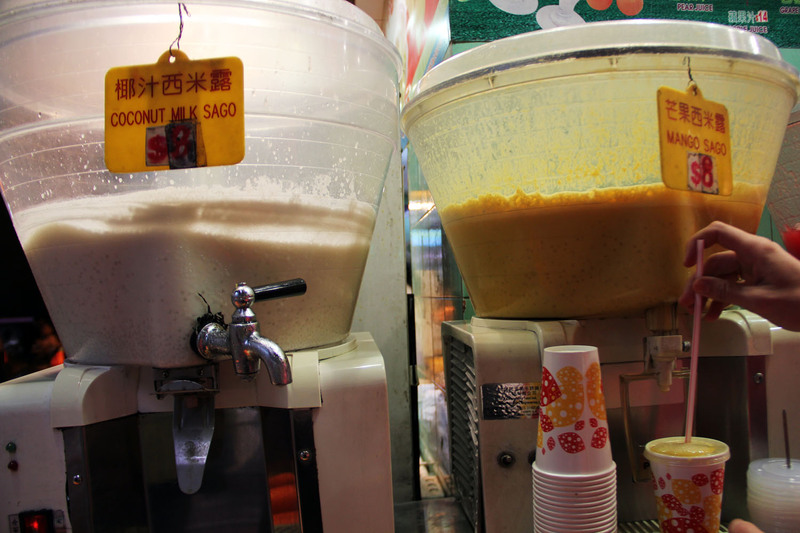 Fresh mango juice with sago (starch beads, smaller than tapioca and slightly softer in texture) is one I used to get frequently because it is sweet and fresh, with a neat textural component from the little sago caviar. Fresh pineapple and coconut milk were close seconds. 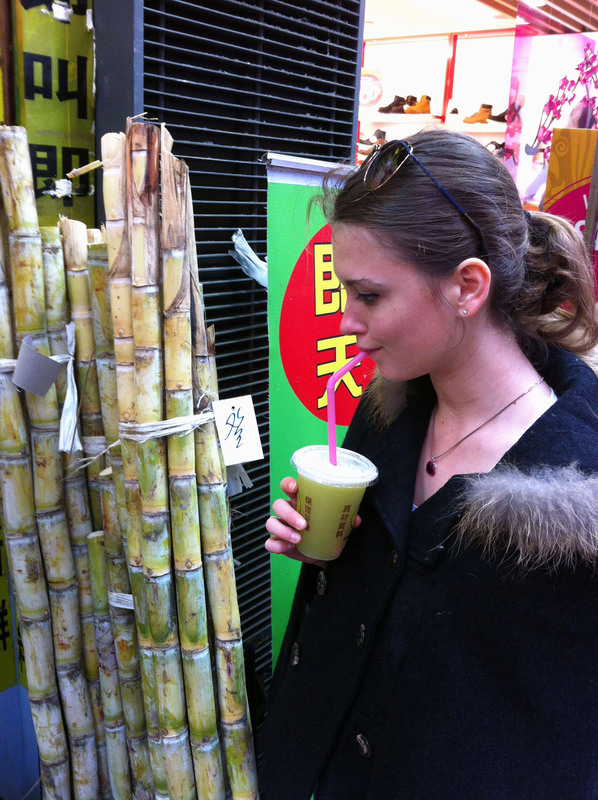 Sugar cane juice was definitely NOT one of my favorites, as it has a slightly oily, slimy texture and a sweetness which is natural but way too overwhelming for me. But it is pretty cool to watch those logs being pressed of their liquid by such a simple little machine. 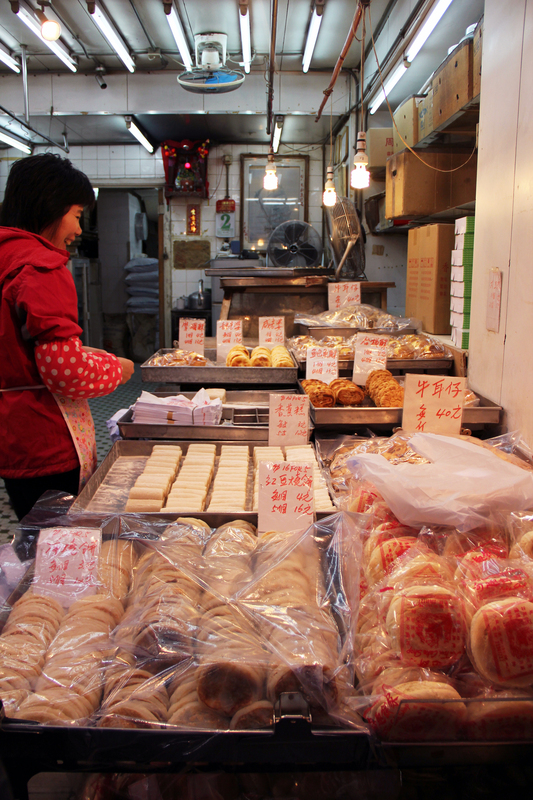 The street also has a few cool bakeries with lotus paste pastries and turnip cakes in various shapes and sizes. 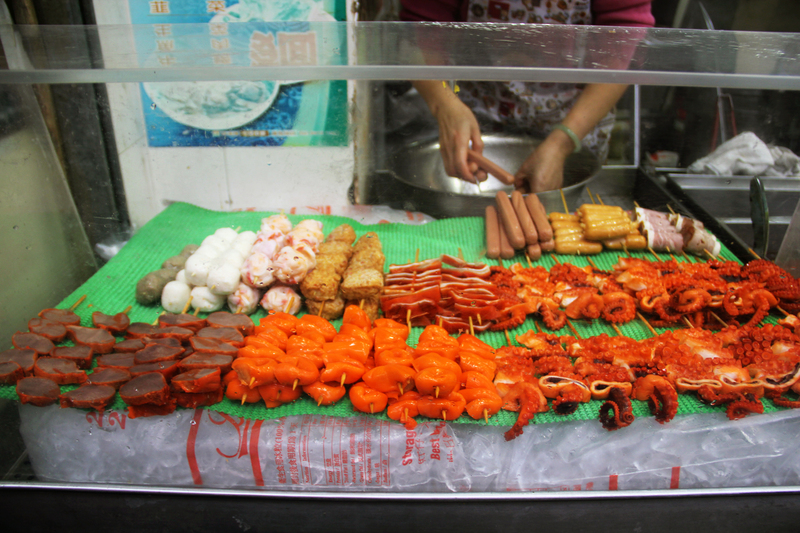 Another one of my favorite food stall corners can be found at Fa Yuen and Bute. Why one of my favorites? For two reasons. 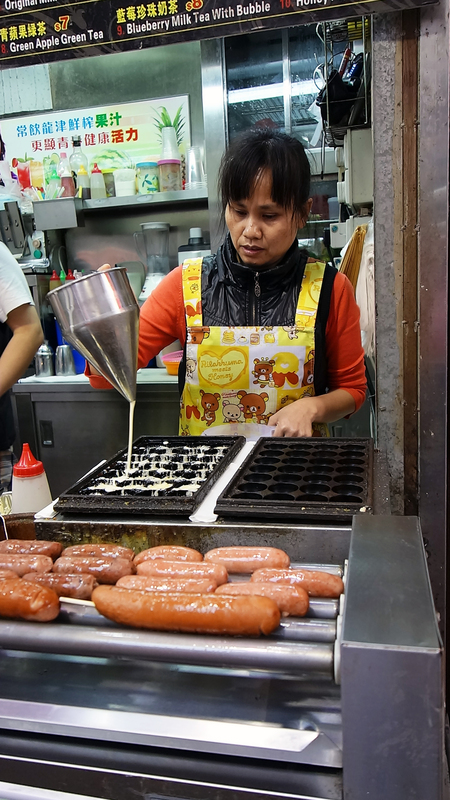 1) It is the only place in Hong Kong where I’ve seen takoyaki being made in the traditional way, by this lady painstakingly flipping the little octopus and scallion balls on a carved out griddle until they become golden brown. Some delicious sauces are then squeezed over the top and some bonito flake sprinkled on for good measure. They’re a delicious cure for morning after maladies. 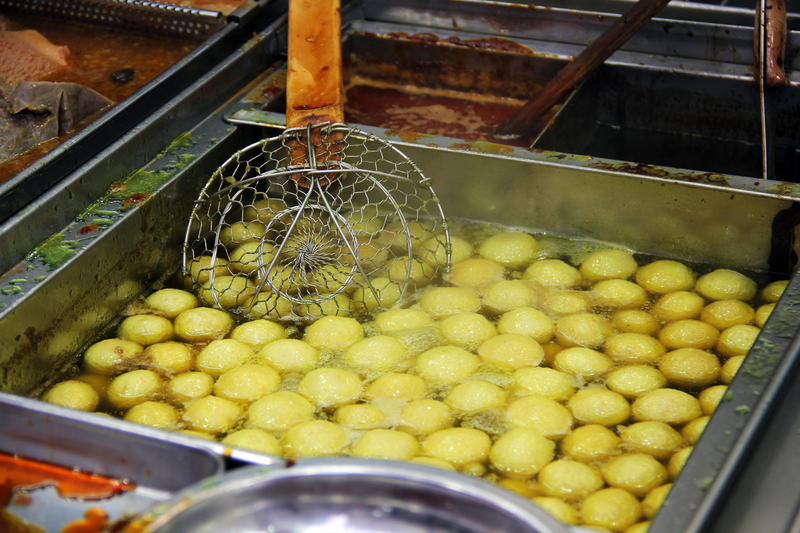 2) It was the first place I ever tried curry fried fish balls, which immediately became one of my favorite street food snacks. 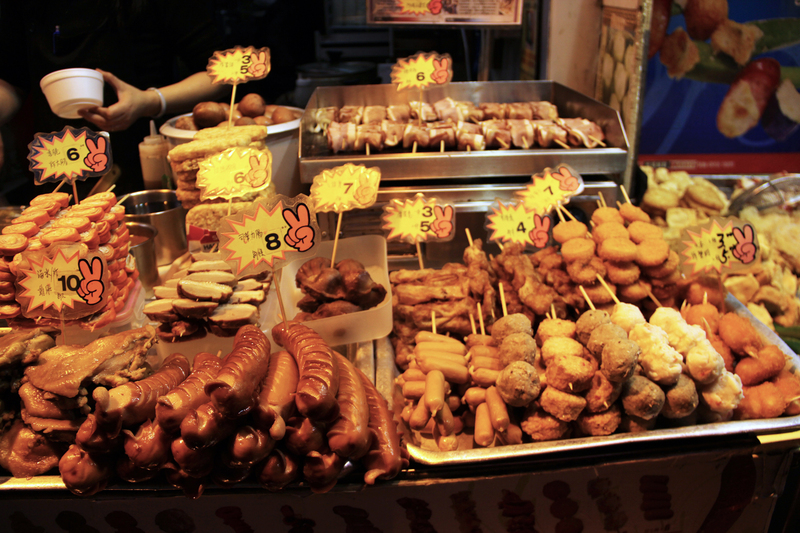 This place also has the most trustworthy looking grilled octopus on a stick as well as very decent shumai. Delicious! 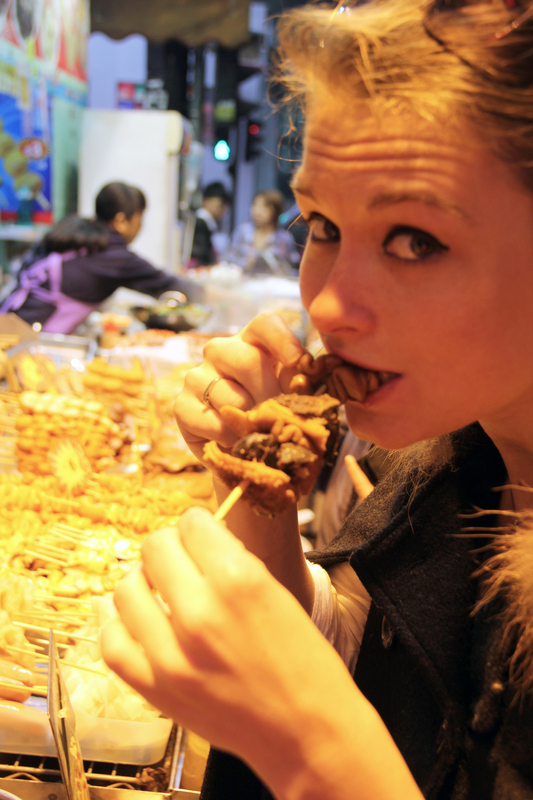 Octopus, gizzards, intestines and all types of balls on a stick. 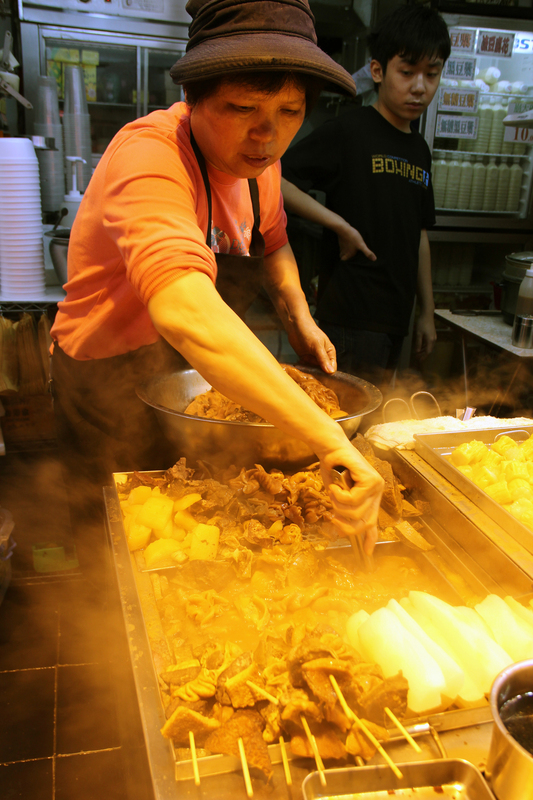 For a tremendous variety of the meatier options, visit the stall at the corner of Tung Choi and Mong Kok Road. The place is actually made up of 2 conjoined food stalls. 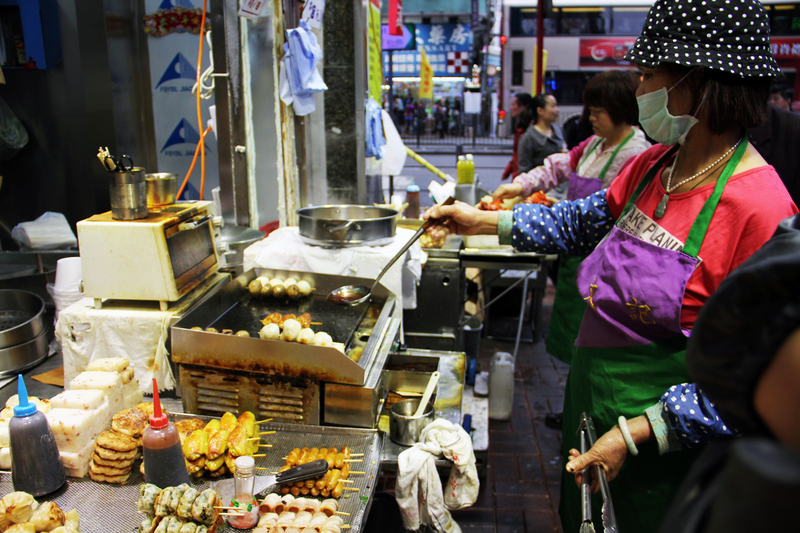 One of these sells the typical shumai-and fish-ball combo, along with veggies stuffed with minced fish and then grilled (of which the eggplant is my favorite). 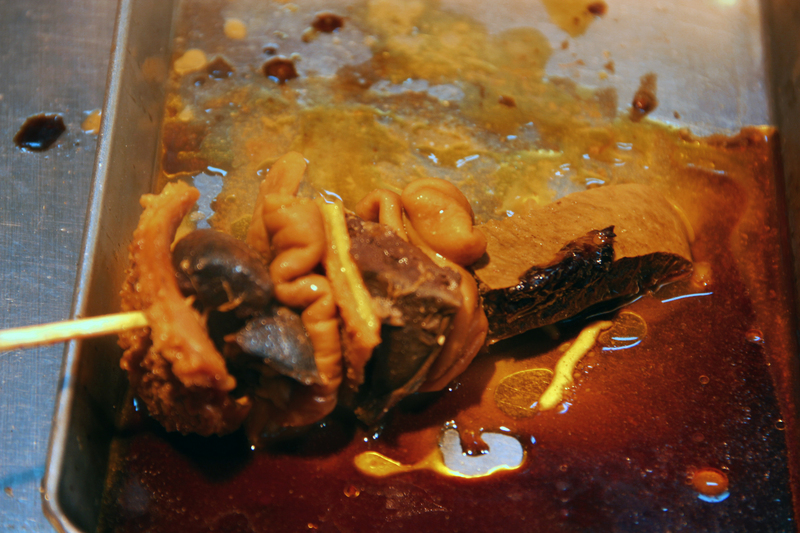 The other tends to the nastier bits – offal in a bowl with some of that offal juice ladled in, solidified cubes of blood, gizzards, intestines and kidneys on a stick, and steamed Chinese daikon radish to clean that innard-y, barnyard-manure flavor up at least a little bit. My favorite thing to get here? 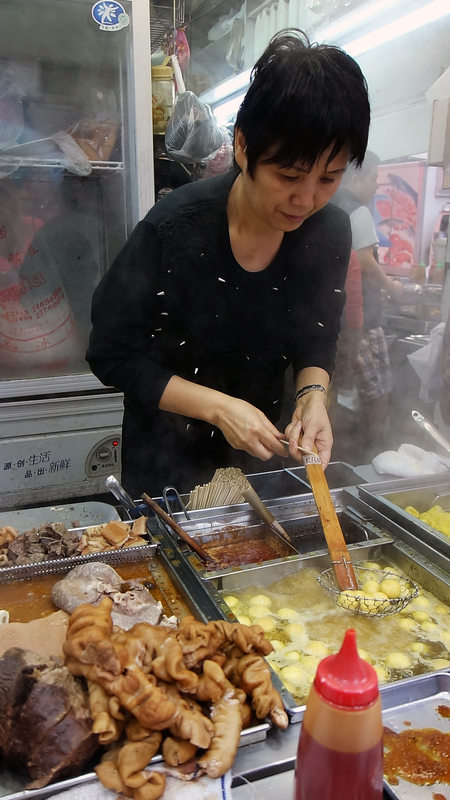 You guessed it, mixed offal on a stick, poked through one by one by a lady hovering like some mythological creature over the distinctly yellow steam rising off the stuff. Yummy. The spot is located under an elevated highway on a popular corner, where teenagers and young adults meet up and hang out for a while, leaning against the metal roadblocks lining the side of the street, smoking cigarettes, drinking 7-11 beers and chowing down on some cheap and delicious steamed innards late into the night. This place is definitely the most “trendy” of the three and has the best people-watching atmosphere to it. 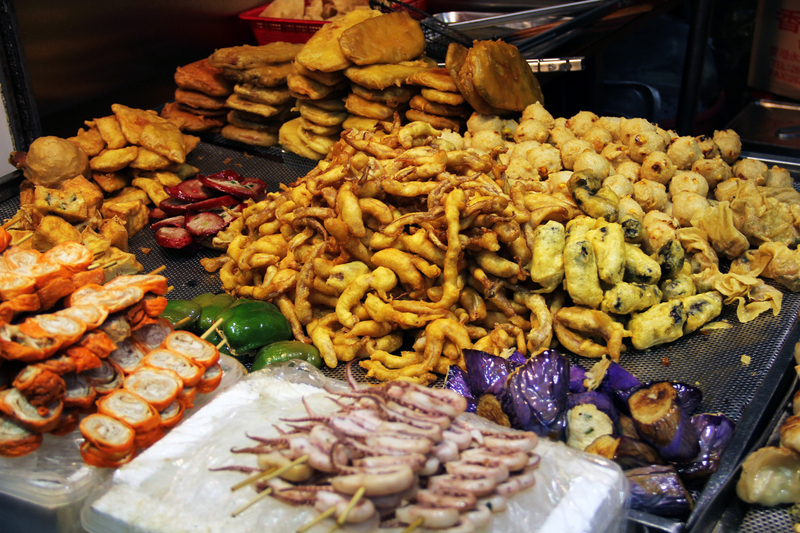 No trip to Mongkok is complete without a visit! 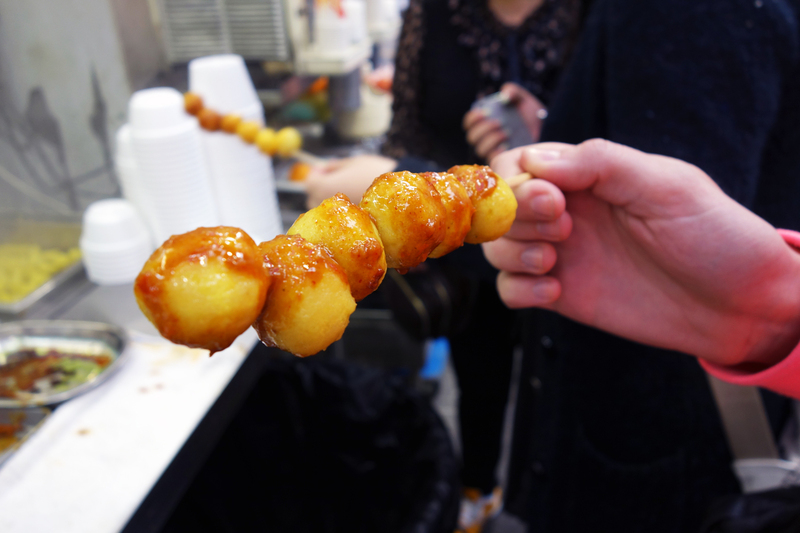 Innards on a stick, my fave! Steamed “white carrot,” aka Chinese daikon radish. Hi! Im flying to HK next week. 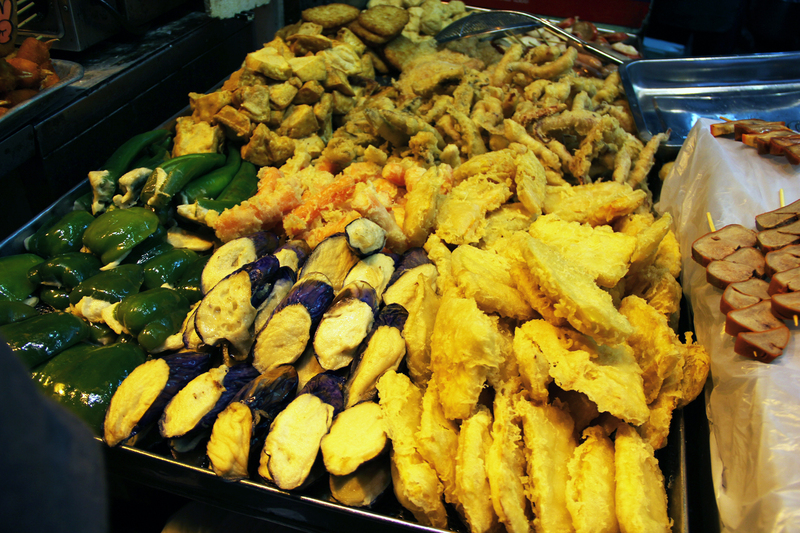 How much do you think should I bring for a food trip in Mong Kok? Don’t blame the chinese boys 😉 – you are hawt! And, for them, unusual. Love ya work! Try anything once. are these places open i the morning too? 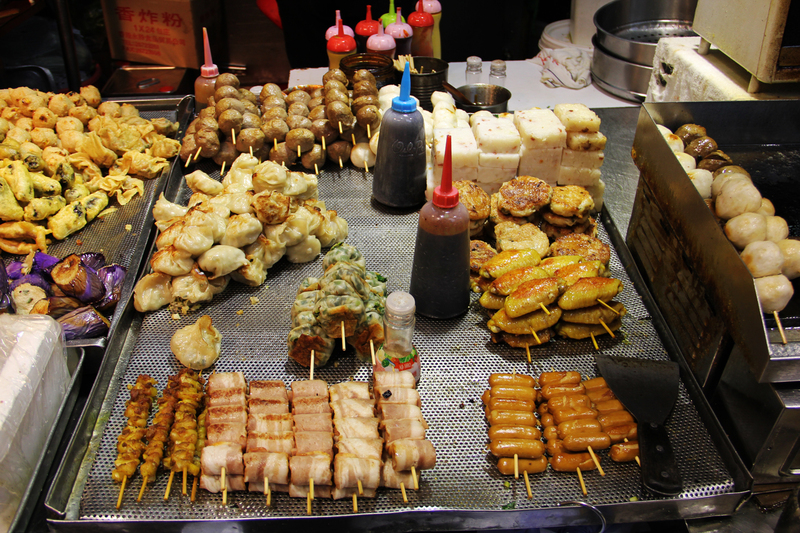 i’ll be having a layover at HK from 7am-3pm and would love to try these street food.